One month into the new year, it’s safe to say that you’ve either given up on your resolutions or you’ve let them take hold. If your struggle with your resolutions is getting you down, there are many memoir-type books about people whose intense, year-long resolutions will make your own seem tame (and you will likely be glad of that if you set your sights lower). The father of this genre is arguably author/columnist/stunt journalist A. J. Jacobs. 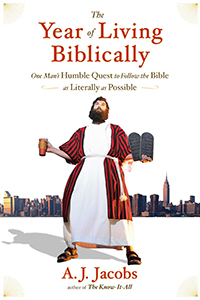 While he has engaged in and written about many of his daring life experiments, his most famous was “The Year of Living Biblically.” Jacobs spent an entire year trying to live his life as closely as possible to the many, many rules laid out in the Old and New Testaments. While the book elicits laughs as he tries to grow the correct kind of facial hair, wear the proper fabrics, and avoid a multitude of obscure sins, it is also filled with poignant reflections as Jacobs explores his spirituality and the faith of others throughout his experiences. Not all of these books are crazy stunts like Jacobs’. Some are based on individuals legitimately trying to change their lives or learn about themselves. In Julie Powell’s “Julie and Julia,” the author is frustrated by the humdrum state of her life, and tries to reignite some passion by cooking (and blogging) all of the recipes from Julia Child’s Mastering the Art of French Cooking in one year. Similar to Jacobs’ works, the story is as much about the protagonist’s internal journeys and discoveries as it is about the triumphs and failures of her current endeavor. You may have seen the movie version of this book, starring Meryl Streep and Amy Adams in the key roles; the book itself is heavy on Julie’s daily life and light on the story of her virtual mentor. 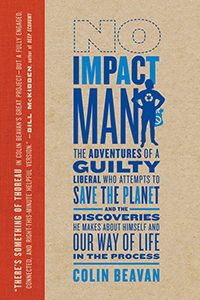 Colin Beavan’s “No Impact Man” is about his efforts to assuage his liberal guilt by making his lifestyle 100 percent environmentally friendly within a year. This would not be an easy task under any circumstances, but Beavan and his family are very comfortable with their abundant and carefree Manhattan lifestyle. His obsession with living in a way that has zero impact on the environment is hard on his relationships with friends and family, and requires substantial physical effort in a high-rise city. In the end, readers can learn a lot from Beavan’s triumphs and failures, especially if they’d like to improve their own eco-footprints. 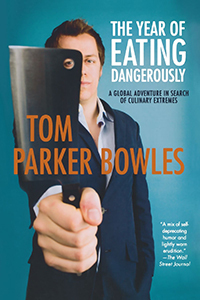 On the opposite end of serenity and self-sacrifice, there’s “The Year of Eating Dangerously” by Tom Parker Bowles. Bowles decides to trek around the world to eat all manner of global delicacies, especially those seen as gross or even deadly to his British neighbors back home. While the other books I’ve mentioned are memoirs of change, Bowles’ is a travelogue of excitement and hedonism from a man who’s already a little on the mad side. The San Diego County Library invites you to join us on our own long-term journey. 1,000 Books Before Kindergarten is a new initiative to enhance family literacy and togetherness by asking parents, grandparents and caregivers to read 1,000 books to their children and grandchildren before the kids enter kindergarten. The program has fun reading logs on which to keep track of their progress, and prizes for every 250-book milestone reached. More info is available at SDCL.org/1000books. Please help us spread the word to all San Diego parents of young children.